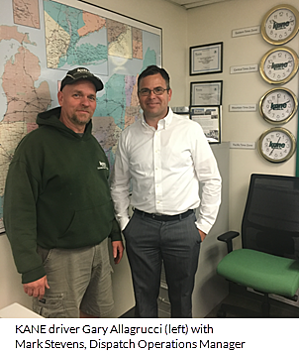 In “Dispatches From the Road," the KANE blog features interviews with our drivers – the men and women who live and breathe the transportation topics we often write about. In this latest installment, we interview KANE driver Gary Allagrucci. How long have you been with KANE? How did you get into trucking? I basically did it in steps. I started out as a mechanic after college, and then drove a straight truck for a while before moving to trailers. From there, I became an owner-operator and eventually found KANE. I started here as a yard jockey before moving to OTR (over the road) six months later. I’m a local driver, so I’m typically within range – about 50 miles or so – of the Scranton terminal. I’m usually out by 6 am and am back home the same day. That’s important to me, especially as I get older. Gene Kane Sr. was a big believer in drivers transitioning to local runs toward the ends of their careers. It has certainly benefited me, as I still get to do what I love without the extra wear and tear. What’s the best part of your job? What do you like the most about it? I love the freedom of being outside; I couldn’t stand to be cooped up inside all day every day. I also like the balance of being by myself in the truck for much of the day, but having that broken up with seeing my colleagues at DCs and customer facilities. I see most of these people every day and have built a nice rapport and relationship with just about all of them. Continuing to build those relationships makes each day successful for me. Everyday is an experience. The day will throw you a curve, so you need to be alert and ready for the unexpected. I think that’s what most people don’t realize about truck driving. This is both a physically and mentally demanding job where you can’t take a moment off. The mental fatigue can be just as challenging as any physical fatigue. What technologies do you utilize to make your job easier? I love my Qualcomm device and the connectivity to dispatch that comes with it. Mobile phones are also fantastic for driving directions. They certainly beat the old days of using maps in the truck. How are you challenged by ELD and Hours of Service regulations? To be honest, it really doesn’t affect me now. As a local driver, my day is so planned out that I’m out and back before I have to worry about HOS. Describe the worst consignee location. In general, I’d say grocery warehouses. You just asked about Hours of Service regulations…if I was worried about them, I’d be particularly concerned with my grocery stops. They have no consideration of a driver’s time. Everything is on their schedule with little regard for us. Now, with all that said, there are some that aren’t as bad as others. What’s the craziest/most unexpected thing that’s ever happened to you while on the job? Well, I’ve definitely seen some things in my years. I once saw a trailer lose its rear tandems while on the highway. The trailer just decoupled from the tandems and dropped onto the road. Up in New England, sometimes you’ll see a moose just standing in the middle of the highway. I’ve also seen a lot of weather-related things like a straight truck getting knocked over by high winds on the GW Bridge. This past winter, I was caught in a snowstorm on I-380 and stuck inside my truck for 21 hours. After several hours, I was happy to see a person driving around giving water and blankets. The person was John Krupskas, a part-time weekend driver from KANE. What’s your favorite food while on the road? Eating on the road is typically a bad idea for my health. So, I try to avoid it altogether by bringing a bagged lunch every day. What do you think of the driver shortage? To me, the solution seems pretty simple: the companies that pay well will attract and keep the drivers. Now, for younger drivers, it’s more difficult. The trades seem to be dying in general. Not enough people are going into careers where you work with your hands. So, if that trend continues, I could see it becoming a problem that money won’t be able to solve on its own. What advice would you give to those considering a driving career? First and foremost, you need to like being a professional driver. It’s not a career for someone to try out half-heartedly. The cost of not being completely focused and committed is simply too high. I would also tell a new driver to take safety – and safety training – very seriously. There are so many variables that you need to be prepared for both inside and outside of the truck. Lastly, I would try to find a company relatively close to where you live so that you can get back home each day.